McRae Capital Management publishes Commentary as a useful service to help our customers and readers realize the rewards of a consistent, disciplined approach to investment management and long-term financial planning in changing times. Starting a family is a wonderful time of life. Whether you and your partner are just starting to think about it or whether your first little one is already on the way, this life stage brings a host of new responsibilities and a number of important new financial decisions. For example, what happens to your children if something happens to one or both of you? How can you secure them financially, and make sure the funds aren’t drained or squandered by the children themselves? How do your insurance needs and tax situation change, now that you have a family? And how can you and your spouse balance long-term savings goals, like college for the kids and retirement for yourselves, with the costs of today’s needs? The questions can be daunting, but don’t be intimidated. This is the perfect time to consider how having children will change your lives financially. We’re here to help you make some key decisions that will set your new family on the path to success. Naming a guardian is important; you don’t want the fate of your children left to government officials. First, lock down your will before you get too busy. Your Last Will and Testament is an extremely important document that states your wishes upon your death. Without one, a state court will determine what happens to your children and your assets—it’s that simple. The second your child is born, writing that will becomes one of the most important things you can do. A will is so critical because it defines two crucial roles: a guardian (or guardians) who’ll become legally responsible for raising your children, and a trustee (or trustees) who will control the financial assets you’ve left behind for their benefit. The guardian and trustee can be the same person, but they don’t have to be…more on that in a minute. Let’s start with the guardian. It’s not easy finding people you can trust to be good parents to your children. How many close friends or family members who share your views and values are also willing to accept this responsibility? This decision probably won’t be made in a day; it usually requires a number of conversations, both with loved ones to narrow down candidates and with the potential guardians themselves. But it’s worth the effort—you really, really don’t want the fate of your children left to government officials. The other important person named in a will is the trustee, who will control the money you leave behind, and make sure it’s there to support your children throughout their lives. The sums involved can be quite large, especially if there’s life insurance involved. And very few parents would be comfortable leaving the entirety of such an inheritance immediately to a minor, or even to a child in his or her late teens (not traditionally the peak years of good decision making). With a well-written will (we always recommend using a lawyer), you can choose specifically how you want your financial support to play out. You can create the trust, name the trustee, and even put in a schedule for how and when you want your child to assume gradual control of your assets, as they become mature enough to take care of themselves. A financial adviser like McRae, in conjunction with a lawyer, can help you set this up. Many families name the same person both guardian and trustee, so that the guardian doesn’t continually have to approach a third party for permission to spend money on behalf of the beneficiary. Other families prefer to establish a separate, objective trustee who is willing to say “no” to the beneficiary from time to time. The choice is yours. One final note about the will: Keep it where it can be found should something happen to you. If it’s tucked away in the back of a drawer somewhere, it won’t do anybody any good. Put a premium on updating your life insurance. Parents-to-be instinctively know they need life insurance to protect their family financially. But it can be hard to know exactly how much your family needs, and whether just one or both spouses should be insured. For many families, it can be difficult to raise the unpleasant topic of death at all, and as a result, many put off this important decision for too long, which is risky. 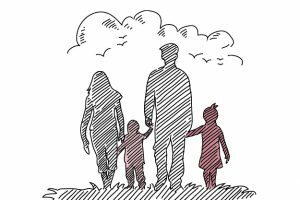 The simplest way to think about life insurance is as a way to replace the financial contributions of the spouse who passes away. So if your family has two breadwinners, consider starting by insuring each one to at least a level that would cover the impact of their lost salary. If there’s one breadwinner and one parent focused on childcare, you might insure the former to cover his/her salary, and the latter to cover the replacement cost of childcare. Beyond salary replacement, you might also want to factor in additional cost-of-living elements you want to have covered, like expected college costs for each child, even if those years are far off into the future. Once you’ve determined financial needs, you can set the insurance amounts needed for each spouse and shop for policies that meet those goals. Long-term disability policies may also factor into your planning. Policies that provide retirement income for a surviving spouse can be considered as well. Finally, remember that the costs and coverage aren’t set in stone. You can up your coverage to match raises, for example. And while life insurance costs generally rise as you get older, your financial risk also diminishes—as your children start to enter the workforce and become self-sufficient—so you can counteract those increasing costs by dialing coverage back. Estimated cost of your newborn’s 4-year private college bill in 18 years: $500,000. * That’s an awful lot of money. Educate yourself on college costs. Raising children can be expensive, but nothing comes close to college in terms of line-item costs. It is estimated that the private college cost for children born today, by the time they turn 18, will top $500,000 over four years. (That’s at the current annual increase of around 6% for college costs, according to CNBC; family income, by contrast, is only rising at around 4.3% per year.) True, you have nearly 20 years to plan for these costs if you start around the time a child is born…but you may need all that time and more. The numbers are truly staggering, and it’s easy to get paralyzed at the thought of trying to set so much money aside. Parents today need to think hard about what their role as a parent will be concerning college costs: Do you feel obligated to pay every dime, or could the costs be split somehow between you and your child? And do your financial means match your goals? At McRae, we’ve helped our clients with a variety of strategies, and we’ve written specifically about saving for college on our website. You’ll probably want to consider 529 plans, for example, which let your contributions grow free of federal taxes over time and can earn state tax benefits as well. Other options like UTMA/UGMA accounts have different rules. Don’t wait to start the conversation, as financial aid offices do discriminate among different sources of money, and how you save can impact your chances for financial aid. The important part is to break the paralysis and begin to have this difficult discussion. Be honest about what you can afford, and develop a plan you can stick to. When bringing each child home, don’t forget the paperwork. There are a number of small-but-important financial updates you can’t make until after the baby arrives. Unfortunately, that’s such a busy and exciting time that many of us forget them, or put them off indefinitely. So make time to review all of your retirement accounts and insurance policies, and adjust them to make the child a contingent beneficiary, so he/she can smoothly inherit those accounts. On the health insurance front, you’ll need to add your child to your basic plan and to any dental or vision insurance you might have. This might also be a good time to consider converting to a family plan or other available options. Don’t put saving for retirement on the back burner. Finally, it’s crucial that you never lose sight of retirement for you and your spouse. When you’re young and your children are small, it’s very natural to think of retirement as tomorrow’s problem, and focus on the kids. But the money you set aside when you’re young has a lot more time to grow (often tax-free), so you don’t want to put it off. Under-fund your retirement to “take care of the kids,” and you may later become a burden to those same kids. Always remember: We’re in your corner. Having a baby is one of life’s most profound emotional experiences, and it’s easy to overlook the financial ramifications and new responsibilities. But if you take the time to get on top of them and create a financial plan that allows you to provide for and protect your loved ones going forward, you can set your new family up for success and confidence. A trusted financial adviser like McRae Capital Management can help you think through these key decisions and put the perfect plan in place so you can stay focused on being great parents. *According to CNBC and Vanguard. Having children is only one of many life stages where smart financial planning can make a difference. McRae Capital can help you understand a host of topics, like the risks of market volatility, how to live off retirement savings, and why taking the long view as an investor is so very important. This article can provide only a general understanding of sometimes difficult financial concepts. For for a more thorough explanation, or if you have questions about your own portfolio, please feel free to reach out to us here at McRae at (973) 387-1080.